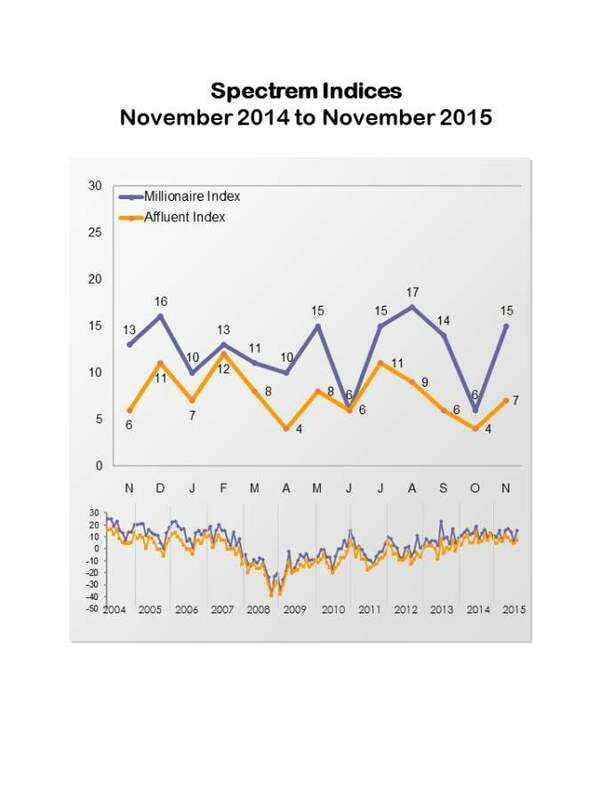 The Spectrem Affluent Investor Confidence Index (SAICI®) edged up 3 points to 7 in November and the Spectrem Millionaire Investor Confidence Index (SMICI®) gained 9 to 15. Both readings are three-month highs. Our indices measure the investment confidence and outlook of the 16MM households in America with more than $500,000 of investable assets (SAICI), and those with $1MM or more (SMICI). This most recent survey was fielded between Nov. 16-22. Year-to-year, the indices have posted modest gains. The SMICI is up two points from November 2014, while the SAICI is up 1 point. Closely-watched economic reports issued in November indicated positive economic movement, which helped to drive increases in the indices. The economy added 271,000 jobs in October, according to the Department of Labor report released in the first week of November. The unemployment rate fell to 5 percent, its lowest level since 2008. The preliminary consumer sentiment index released by the University of Michigan in mid-November rose to a better-than-forecast 93.1. In advance of the holiday shopping season, which can account for up to 40 percent of annual sales, the National Retail Federation forecast an increase in total sales this year. On the homefront, Affluent investors indicate an increased confidence in their household assets and company health. These attitudes helped to buoy the November Spectrem Affluent Household Outlook, a measure of confidence in financial factors that impact affluent investors’ daily lives. The November Outlook ticked upward to a four-month high, and this, too had a positive impact on the Spectrem Investor Confidence indices. But concerns about terrorism are lurking in the background and the recent attacks in Paris and subsequent escalated threat levels have left Affluent investors feeling cautious and uncertain. These investors tell us that reports about terrorism are the news stories currently having the biggest effect on their investment plans. In addition to terrorism, Affluent investors have lingering concerns about the global economy and the timing of the Federal Reserve’s raising of interest rates for the first time in seven years. These concerns are compelling more Affluent investors than in the previous month to hold for the short term on the investment sidelines. This is the third consecutive month these investors have indicated they would do so. When asked how they intend to invest in the coming month, Affluent investors indicated a retreat from Cash and Stock Mutual Funds. But there is an increase from the previous month in those who say they will invest in Stocks. Analyzing Affluent investment preferences by Millionaire and non-Millionaire households, we find that Millionaire investors who indicated that they plan to remain on the investment sidelines in the coming month was basically unchanged from the previous month. But among non-Millionaires, “Not Invest” gained 2 points from October to 46.3. On an encouraging note, this is a four-point improvement over the same period last year. Non-Millionaires are generally less optimistic investors than their Millionaire counterparts.